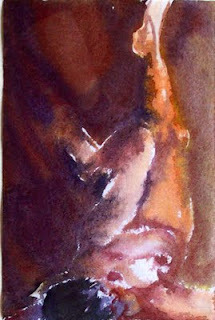 Very small paintings are just as challenging as big ones. It has to be interesting enough to make it worth the effort of putting one’s nose up to it to see it. This has that and an abstract quality for a good composition. 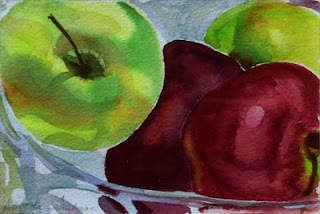 This a a small still life yet the apples are life sized. You can see the edge of the glass bowl in which they sit. I missed this study for the mural. This is Study #8. It’s a moraine left by a retreat glacier in Wisconsin. You can just see the ‘stone hedge’ to the right. These are rocks that are forced to the surface by winter freezing. To till the soil they have to be removed from the fields first. Hence, ‘stone hedges’ or just piles of stones in out of the way places. This a fast, very wet masa watercolor. I think that’s very apparent. What is exraordinary is that the model voluntarily took this pose and held it for 20 minutes. Oy vey! When I paint outdoors it seems I depend a lot on my car. I have a mini-van that is so right for me for schlepping big paintings and for finding just the right outdoor location for a painting. Then it serves as shade from the sun. So here I am painting in the tailgate shade in my hat and sunglasses. Here is another study. I like the combination of abstraction and representation at the same time. It says water, trees, and rock without too much fuss. This is a view of the shore of Lake Michigan through the trees above the shore line. This part of the shore is line with steep limestone ledges which erode from wave action especially during winter storms. This an early summer view. 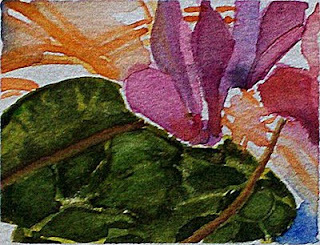 I think this is my favorite of the tiny studies for the mural. It has an abstract, fluid quality that I really like. Unfortunately it is very difficult to scale up to a larger size. The physicality of painting big is too great a difference from painting small. Oh well! This another in a series of outdoor self-portraits. I am a Great Lakes mid-westerner. I have spent my life near the shores of these vast freshwater lakes and I still love to be near them in the summer. Here I have planted my easel with my warehouse mirror on the shore of Sister Bay, Wisconsin. I wanted to show the waters of the bay. Unfortunately I had a view behind me that I didn’t particularly like—a gas station. So I turned my mirror around and painted the bay again! I am holding on to the camp stool I was using as a table for my watercolor palette because it was so windy it would have blown away otherwise. I am wearing my favorite painting hat. I have unfortunately lost it since then and haven’t found another one to replace it. It covered my neck and ears to prevent sunburn. Something very important to a sunburn queen. I called it my ‘Davida of the Desert’ hat. This another mural study. The landscape in the midwest is dotted with clumps of trees that were planted for windbreaks or on areas that are not suitable for cultivation or for reasons only the owners of the property know. Sometimes the the trees are on ground that is littered by glacial till left by receding ice during the last ice age making it impossible to plow and plant. There are glacial landforms and stone ‘hedges’ all over the upper midwest. What ever the reason, I am fascinated by the islands of the trees as I drive north to my favorite rural haunt.